The post Multilingual Report Cards May Be Coming Soon To Hawaii Schools appeared first on Honolulu Civil Beat. The Hawaii Department of Education plans to gradually roll out the option of preparing student report cards in languages other than English, starting with Hawaiian, according to a presentation delivered to the Board of Education last week. “What we are going to be able to look at doing is, (ask), what language would you like your report card in, family, and we will be able to give it to you in that language,” Brook Conner, chief information officer for the department, told the board. It’s not clear when the option might become available, but the idea was floated as part of a lengthy presentation Conner delivered outlining the DOE’s five-year plan to move documents online, modernize its financial systems and plan other technological updates. DOE’s student information system, Infinite Campus, will allow issuing report cards in a variety of languages. Roughly 8% of Hawaii’s public student body, or close to 15,000 students, are “English learners,” with the most common languages spoken among students being Ilocano, Chuukese, Marshallese, Tagalog, Spanish, Japanese, Mandarin and Samoan, according to a 2019 DOE briefing to the Legislature. A March 2016 report by the Hawaii Department of Business, Economic Development and Tourism measured Hawaiian as the fifth-most spoken language at home other than English, behind Tagalog, Ilocano, Japanese and Spanish. Both English and Hawaiian are considered official languages of the state, which is why the DOE may be looking in that direction first when it comes to the report cards. In early 2016, the Board of Education approved a new “Multilingualism for Equitable Education” policy whose three-year implementation plan included providing language programs for multilingual students, equipping teachers with more preparation and instructional materials and providing better outreach to families. The post DOE Lays Out A 10-year ‘Road Map’ For Fixing Old Schools, Building New Ones appeared first on Honolulu Civil Beat. Hawaii Department of Education officials are hoping a new statewide facilities master plan will persuade lawmakers to provide more money for maintaining and renovating aging public schools and building new facilities. Extensive and wide-ranging, the master plan lays out an exhaustive list of 1,300 desired capital improvement projects across all 261 DOE campuses. It was published late last week on a website managed by Jacobs Engineering Group, an outside firm commissioned by the DOE to conduct the study. The estimated total price tag for “top priority” projects, such as additional classroom space to account for overcrowding or basic repair and maintenance to make schools safer, is $7 billion, according to the 309-page report. That figure rises to $11 billion when accounting for all levels of priorities. Under the DOE’s current approximately $300 million annual CIP allocation from the Legislature, those “Priority 1” projects — which include the “highest, non-negotiable needs” identified in each area of Hawaii — would take 23 years to address. 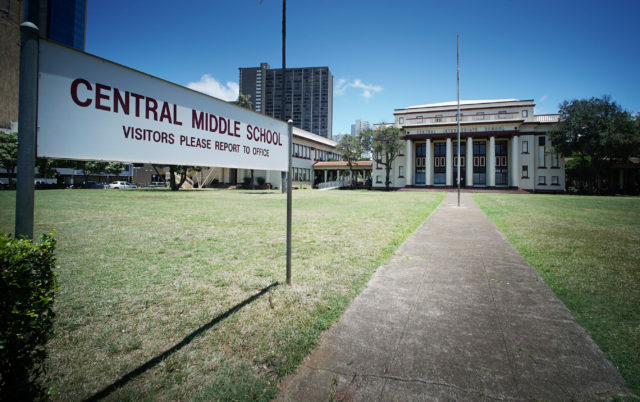 Central Middle School is a historic school building in Honolulu, built on the grounds of the former palace of Princess Ruth Keelikōlani. The average age of the state’s school buildings is 60 years old. “This is the first time the state Department of Education has a facility master plan – how are we going to invest in the important and often small amounts of CIP funding we get,” said Assistant Superintendent Dann Carlson, who is in charge of facilities for DOE. The master plan is the culmination of a years-long contract Jacobs had with the DOE to complete a statewide facilities assessment, evaluate how the needs match up with education standards and determine the best process to address those needs. That contract was initially estimated to cost $4.6 million in 2014, but rose to $7.9 million as the scope was broadened from developing an Oahu schools’ master plan to a statewide assessment, according to contracts between DOE and Jacobs. The purpose of the master plan is to provide a “10-year roadmap” for school officials to consider how it wants to prioritize capital improvement projects and actually deliver on them. “The goal of this facility master plan is simple: a quality school for every child, regardless of where they live,” the report states. The categories for these capital improvement projects include capacity and instructional needs, such as building more classrooms that support STEM, visual arts, career and technical education. They also cover meeting gender equity and accessibility requirements, as well as basic repair and maintenance, starkly captured in anonymous comments sprinkled throughout the report. “Main building is sinking in certain areas. I have to put my legs around the desk to stay still because my chair slides off,” the principal of Naalehu Elementary on Big Island, whose name is not included in the report, is quoted as saying. The proposed projects include meeting basic needs such as air-conditioning for classrooms. But there are also highly ambitious proposals like a $20 million to $40 million construction project at Central Oahu’s Mililani Uka Elementary, complete with a new three-story classroom building, cafeteria, kitchen and covered multi-purpose area. DOE officials emphasize that the wish list was compiled through extensive community engagement. The effort involved 500 people, including parents, students, teachers, principals and administrators around the state. There were 100 workshops held during the past year culminating in a two day “summit” on Oahu in February to discuss goals and objectives, according to the report. 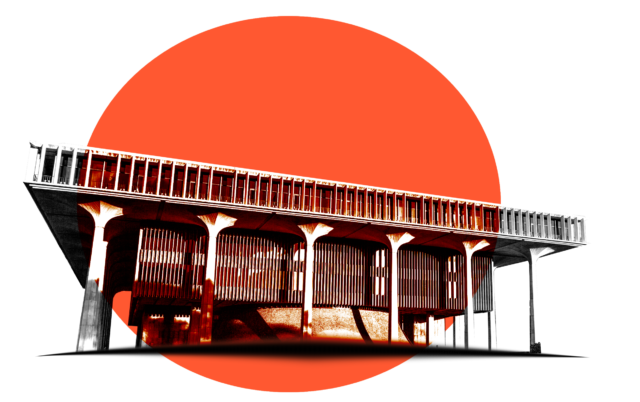 Many of its buildings are worn and aging — DOE facilities, which span 20 million square feet of space across the state, average 60 years in age. Changing migration patterns around the state have contributed to schools that are both over- and under-capacity. And a politicized system of “legislative add-on” line item projects often bump other projects off the DOE capital improvements priority list, the report notes. “Without a strategic plan, the result has been sustained inequitable allocation of public resources, with some students benefitting at the expense of others who are under-represented,” the plan states. There are schools in “high-growth areas” that are short of seats for up to 12,000 students. Other areas shrinking in population have “more than 22,000 surplus capacity for students that are no longer there,” the report notes. Dann Carlson, assistant superintendent for school facilities, said the facilities master plan is “a starting point” to drive DOE decisions moving forward. The more open question is how the facilities master plan will drive DOE decisions moving forward. There’s an existing DOE “priority list” for CIP projects and this plan is just a “starting point” to steer it in certain directions, Carlson said. “It’s a valuable resource we can draw from and look at in making our decisions for planning as we go forward,” said John Chung, public works administrator for the DOE. There are big questions about where the funding will come from. The plan recommends finding new funding sources and models, including issuing asset revenue bonds, or raising the sales tax, tourism tax or property tax for education. The current funding framework is “insufficient to deliver top statewide priorities within a reasonable timeframe,” the plan says. 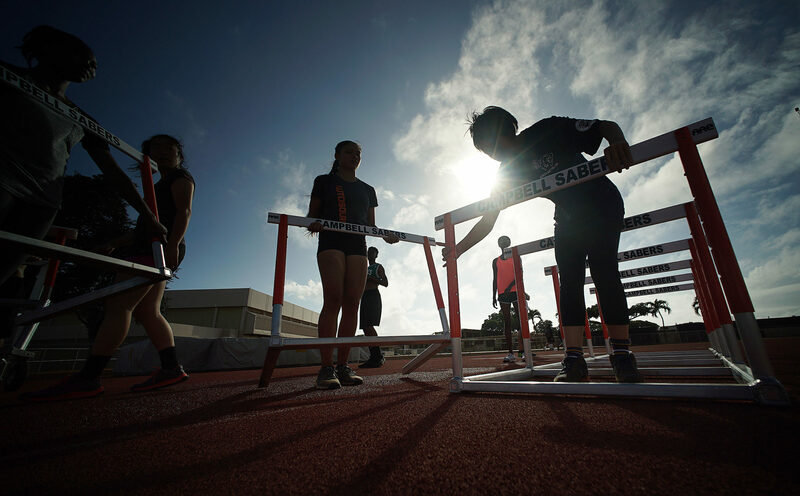 But the 10-year plan will take “a fundamental change of political institutions” that involves a “broad legislative information campaign and courageous leadership from HIDOE, Board of Education and legislature,” the report continues. The DOE in the 2019 fiscal year requested $783 million for its CIP budget. The Legislature approved $281 million. It’s not clear whether the existence of this new facility master plan will sway lawmakers in appropriating more down the road. Senate Ways and Means Committee Chair Donovan Dela Cruz said the DOE needs to come up with “a portfolio of ways” to fund projects and that the Legislature needs to balance the school system’s needs with other needs throughout the state. “I don’t think the Legislature, or the governor or budget director will give up their fiduciary responsibility and just take whatever (figure) the board (of education) sends to the Legislature verbatim,” he said. The post State Initiates Audit Of School Impact Fees On Developers appeared first on Honolulu Civil Beat. 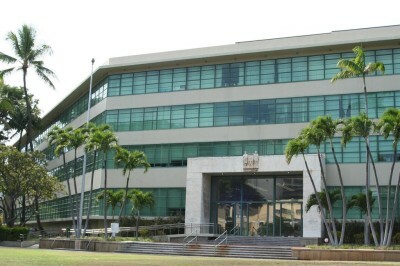 The Office of the State Auditor is auditing a program in which the Hawaii Department of Education collects impact fees from residential housing developments in certain areas. School impact fees were established by the Legislature in 2007 to address the impact of new residential development on schools. Act 245 directed developers to either pay a fee or provide land to contribute to the cost of building new or expanding existing DOE facilities. The DOE has since identified five impact districts for the fees — the latest being the Kalihi to Ala Moana corridor on Oahu that tracks the path of the Honolulu rail project — which has so far generated about $5.5 million total, in an account maintained by the DOE’s facilities branch. Department of Education personnel, as well as some board members and outside stakeholders, have already been asked to provide information about how the program operates, Kondo said. His office has been working on the audit since mid-February, with a draft report expected sometime in June. 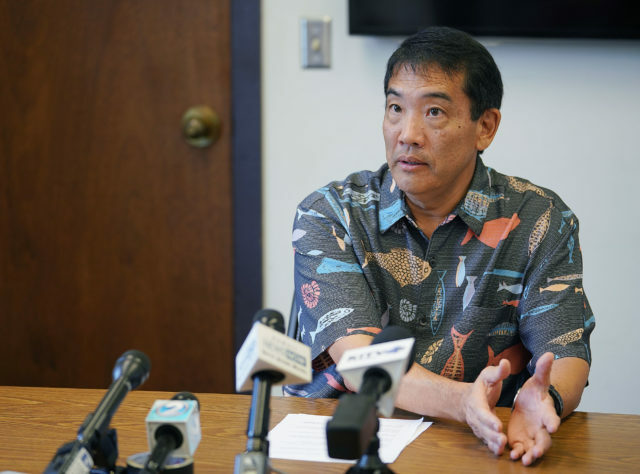 Although state audits typically take six months to complete, Kondo told the board he expects a quicker process because of the relatively small scale of the fees program. Implementation of the fee program has been uneven and sometimes controversial over the years. 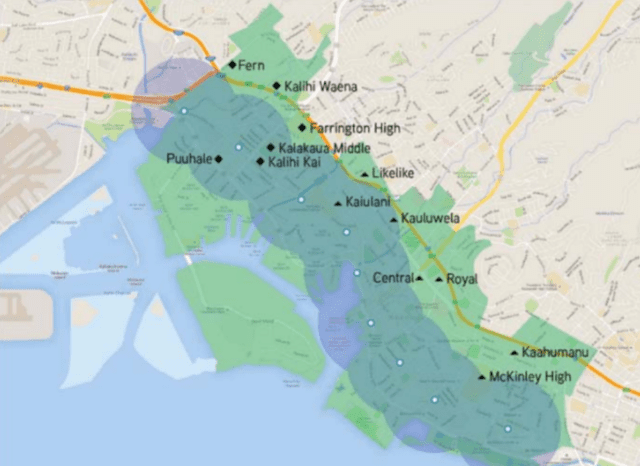 The newest impact fee district stretches from Kalihi to Ala Moana. The program concept raised a grumble in West Hawaii — the earliest school impact district identified by the DOE — causing then-mayor Billy Kenoi to refuse to collect fees from developers, saying they would financially burden small property owners. The area has not collected any school impact fees to date and Kondo told the board he didn’t plan to approach the current mayor, Harry Kim, about those underlying reasons. The Legislature came up with the formula for school impact fees, while the DOE determines the district and conducts the fee analysis. Fees are calculated by the total school land requirement multiplied by the value per acre of potential future school sites. While the DOE conducts its own internal financial audits, it’s faced some increasing calls in recent years by legislators for a financial audit from the state Auditor’s Office, as proposed by Senate Bill 856, which is still alive this session. Kondo’s office did not take a position on that bill, instead commenting that it would prefer to see a clarification of the scope of the desired auditing or more specific direction. When it comes to the school impact fees, Kondo told Civil Beat he purposely chose this program because it would be relatively easy to do in the designated timeframe and responded “I do not know” as to whether it’s a potential sign of more DOE audits to come. The post Ige Appoints Kamehameha Schools Official To Board of Education appeared first on Honolulu Civil Beat. A longtime educator from the Big Island has been nominated to serve on the Hawaii Board of Education, Gov. David Ige’s office announced Friday. 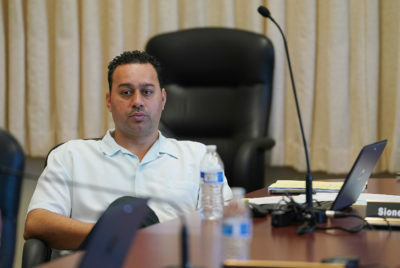 Damien Kaimanaonalani Barcarse, the West Hawaii director of Kamehameha Schools, would replace Patricia Bergin, a former teacher and administrator from the Big Island whose three-year term expires June 30. Barcarse, whose nomination is subject to Senate confirmation, is fluent in the Hawaiian language and knowledgeable about Hawaiian culture. He’s also a licensed captain with experience in Pacific and international voyaging who spent time on the Hokulea during legs of its worldwide voyage, including to Africa and the central Pacific area. 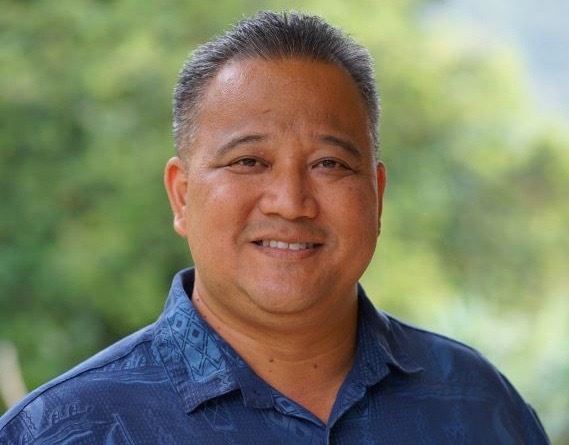 Damien Kaimana Barcarse has been appointed to the Hawaii Board of Education. He said Friday he’s “very, very humbled” by the appointment. The all-volunteer, nine-member board sets policy for the public school system and is also charged with selecting and evaluating the school superintendent. “It’s just really an opportunity to serve, and to make more the norm we’re encouraging our students to be the best they can be,” Barcarse said. A resident of Kona, Barcarse, 48, is a product of the public school system. He attended Waiakeawaena Elementary, Waiakea Intermediate and Waiakea High School on the Hilo side of the Big Island. The first in his family to complete college, Barcarse credits an educator in his youth with encouraging him to explore a high school-to-college enrichment program that took him to BYU Hawaii for a summer and instilled in him a desire to pursue higher education. Barcarse received a bachelor’s degree in Hawaiian Studies and a master’s degree in Hawaiian Language and Literature from the University of Hawaii Hilo. He taught ethnozoology and voyaging and navigation classes for the Hawaiian Studies division at UH Hilo before moving to Kamehameha Schools in 2013. He’s held a variety of positions there, including director of the Hawaiian Cultural-Based Education Department, senior project manager of the Aina-based Education Department, and education officer responsible for helping DOE-area complexes with the former Kahua teacher induction program, which helped teachers from the mainland unfamiliar with Hawaii learn different facets of the culture. Barcarse also moonlights on Sundays as a DJ and program producer for the Alana I Kai Hikina, Hawaiian language, for KWXX-FM. He discussed his support of Early College programs that enable high-schoolers to receive credit for college coursework, more internship and mentorship opportunities from local businesses and a way to make it possible for students in rural areas to still participate in activities like after-school programs. Also on Friday, Ige reappointed Kenneth Uemura and Bruce Voss, both of whom joined the Board of Education in 2016. 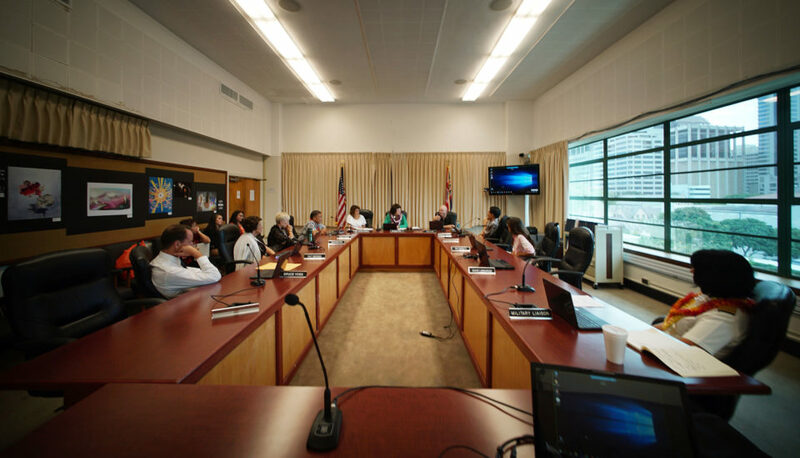 The post Following Lawsuit, DOE Revives Its Gender Equity Committee appeared first on Honolulu Civil Beat. The post Charter School Clampdown Has Educators Worried About Their Independence appeared first on Honolulu Civil Beat. A bill to give the state more financial control of Hawaii charter schools has some educators worried about what they see as a threat to the charters’ independence. House Bill 622 introduced by House Finance Committee Chair Sylvia Luke is in part a response to unconfirmed reports of federal investigations of several charter schools in recent years over alleged financial mismanagement or other irregularities. The schools are not currently required to inform the state of such investigations. It also tasks the commission with establishing and maintaining a central bank account system to manage expenditures for all charter schools and selecting the auditor who will conduct yearly required financial reviews of the schools. The measure is opposed by many charter school officials and has raised concerns at the state Board of Education. Ka’u Learning Academy was shut down by the state because of financial irregularities and enrollment discrepancies. 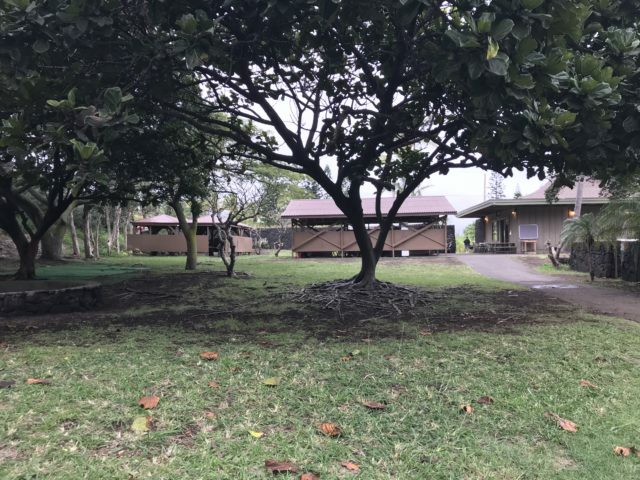 It was operated out of a former golf clubhouse in Naalehu on the Big Island. Commission members are nominated and appointed by the Board of Education, whose members are appointed by the governor. Several charter schools have come under scrutiny by the commission, which authorizes contracts with the schools and monitors their compliance with state and federal laws. It can also initiate reviews, enforce intervention or revoke contracts when schools fail to adhere to standards. More recently, Kona Pacific Public Charter School, a K-8 school on the Big Island, received a notice of revocation by the commission for alleged commingling of funds between the school and the nonprofit Friends of Kona Pacific Public Charter School and also allegedly inflating its enrollment numbers, according to West Hawaii Today. State Public Charter School Commission Executive Director Sione Thompson said problems at a few charter schools aren’t representative of the entire system. The 36 public charter schools currently in operation — along with DreamHouse Ewa Beach, scheduled to open in July — are part of the Hawaii public school system but run by independent governing boards that select and hire school leaders, set curriculum and oversee the financial health of the school. Correction: An earlier version of this story said charter schools are part of the Hawaii DOE. Charter schools comprise about 11,500 students, or 6% of the total public school population. They are subject to the same statewide assessments and measures of student achievement as DOE public schools, but founded on the premise of being laboratories of innovation and thus removed from the oversight that DOE has for traditional public schools. Burrowed within this framework of independence is also deep-seated financial uncertainty. Charter schools’ per-pupil funding this year was $7,466 per student — compared with $13,748 per student in regular schools. They must also pay for renting space with these funds as there’s no separate facilities allotment. Malama Honua Public Charter School in Waimanalo, which opened in 2012, is one of 36 charter schools operating in Hawaii. That’s why proposed legislation to shake up the funding disbursement system or impose new controls has some charter school leaders concerned. Steve Hirakami, founder and director of Hawaii Academy of Arts & Science, on the Big Island for nearly 20 years, called House Bill 622 “a knee-jerk response to one or two errors” made by a handful of other charter schools. “One school makes a mistake and they (lawmakers) paint a broad brush and say, you all got to do it,” Hirakami said. The Legislature’s base budget for the upcoming school year includes $96 million for charter schools and $101 million for the 2020-21 school year. At least 17 of the state’s charter schools are Hawaiian culture focused. The Office of Hawaiian Affairs, which has submitted testimony in opposition to House Bill 622, has provided about $22 million in financial support for those schools since 2005-06. House Bill 622 has taken several forms since it was introduced. An earlier version passed by the House Finance Committee called for a centralized purchase order system that would have required charter schools to make specific funding requests to the commission before they could receive funds. That proposal has since been replaced with one calling for the commission to establish and maintain a central bank account system for charter school expenditures. “The whole crux of 622 is actually the financial accountability,” said Luke. She pointed to the current system of charter schools getting their per-pupil funding from the commission through a lump sum distribution from the Department of Budget and Finance. Lawmakers this session have held up financial transparency in agency budgets as a mantle. Some believe this measure reflects that shift. In written testimony for an earlier version of the bill, the Charter School Commission proposed the bank account system as an alternative to the purchase order system. Thompson, the commission’s executive director, pointed out that each charter school maintains its own private bank account to manage finances, and that the commission relies upon self-reporting. There are times, he said, when some of the quarterly reports don’t align with the annual reports or audits of the schools. Since charter schools contract with their own auditors, the commission receives the final reports but does not necessarily have access to the underlying data used for those audits, Thompson said. “We do believe there should be a state oversight to the audits that doesn’t preclude independent schools from having their own independent audits,” he said. Another component of the bill that is unsettling to charter school leaders would impose a four-year waiting period before anyone who has been affiliated with a charter school can sit on the commission or state Board of Education. “That’s really an insult to the credibility of the people who are busting their butts to make this thing happen under all adverse circumstances and inadequate funding and dedication,” said Hirakami. Board of Education Board Chair Catherine Payne has concerns about several aspects of the charter school bill. 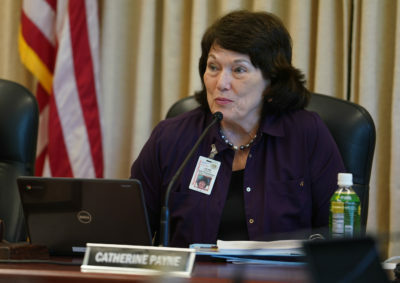 The current BOE chairwoman, Catherine Payne, was appointed to that position by Gov. David Ige in 2018. A former DOE principal, she was at the time serving as the chair of the Charter School Commission. The commission currently includes at least four members who were formerly affiliated with charter schools or their governing boards, including Mitch D’Olier, who noted that those commissioners are aware of the financial challenges facing charter schools and that this knowledge is “very helpful” in discussions. On behalf of the BOE’s ad hoc legislative committee this session, Payne has expressed concern with several aspects of the bill, including shifting funding control away from schools upon the filing of a federal charge against an employee. She has proposed amending that to require charter schools to inform the commission once an employee comes under federal investigation. 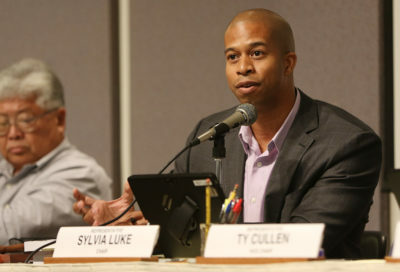 “We absolutely support legislation that holds charter schools accountable and has authorizers holding charter schools accountable but there is enough legislation already that gives authority to the authorizers and to the board to hold these schools accountable and they’re working really hard to address that,” Payne said. The measure passed out of the House Finance and Lower and Higher Education committees before crossing over to the Senate. The Senate Education Committee then heard it, followed by Ways and Means. Only one lawmaker, Sen. Kurt Fevella, who sits on the Ways and Means Committee, cast a dissenting vote. The post Push To Increase Spending On Schools Loses Momentum appeared first on Honolulu Civil Beat. When last year’s proposed constitutional amendment to allow the state to raise more money for public education by implementing its own property tax was shot down, even opponents said Hawaii’s schools needed more money and vowed to help them get it. A year later, that doesn’t seem to be happening at the Hawaii Legislature, where leaders are now saying the lesson of 2018 was that there needs to be better transparency in current school spending practices before more money is provided. “Education doesn’t seem to be at the top of the agenda this session, which seems to me puzzling and interesting because there was so much discussion over the ConAm,” said Colin Moore, director of the Public Policy Center at the University of Hawaii Manoa. Last year’s proposed constitutional amendment, which drew plenty of opposition before it was invalidated by the Supreme Court, has been followed by a much quieter legislative session when it comes to education funding. While the proposed constitutional amendment was ultimately invalidated before the election by the Hawaii Supreme Court for its vague wording, it stirred up intense debate over the adequacy of public school funding in Hawaii that left many people wondering how it would shape future talks. This year, however, most education funding proposals are not faring well in the Legislature. One casualty this session — and perhaps the most analogous to the constitutional amendment as far as raising more money — was a Senate bill to increase the general excise tax by 0.5 percent to steer additional funding to the Hawaii Department of Education and the University of Hawaii. The idea, which has been floated before, was a long shot from the start. The bill did cross over from the Senate, but will not get a hearing in the House, Sylvia Luke, the House Finance Committee chair, decided. The Hawaii Department of Education’s spending practices would be audited every three years under a proposed bill. Greater transparency for the DOE’s nearly $2 billion annual operating budget was also called for by constitutional amendment opponents, including those in the business community. “The Legislature took that very seriously. We heard that the community also wanted that aspect of it,” House Lower and Higher Education Chair Justin Woodson said earlier this session. That’s what sparked the decision to turn to a new budgetary process this session to give committee chairs more authority over department budgets, Woodson said. Aside from one other bill to appropriate money for repair and maintenance of DOE buildings, it’s the only education measure the chamber is supporting this year. Representatives of the Chamber and Affordable Hawaii Coalition, a political action committee organized last year to oppose the constitutional amendment, could not be reached for comment Wednesday. The Hawaii State Teachers Association, which led the two-year effort to get the constitutional amendment on the ballot last year, opposes an audit and is instead pushing for a bill to commission a study on the adequacy of education funding in Hawaii. “Although the audit may identify inefficiencies as everyone would expect, it will not find a large enough sum to make up for the inadequate funding of our public schools,” HSTA President Corey Rosenlee said in written testimony. Another education funding measure still alive this session is Sen. Stanley Chang’s measure to offer DOE teachers placed in harder-to-staff geographic areas $500 monthly vouchers to help offset the cost of rent or mortgage payments. Other bills that called for establishing a minimum starting pay for certified teachers and automatic step pay increases have stalled. Last year’s constitutional amendment — whose primary backer was the HSTA — generated controversy from the start. The proposal, significantly watered down by the time it passed out of the Legislature, asked voters whether the Legislature should be authorized to establish “a surcharge on investment real property” to support public education, without offering any parameters as to what constituted “real property” or how new funds might be spent by the DOE. 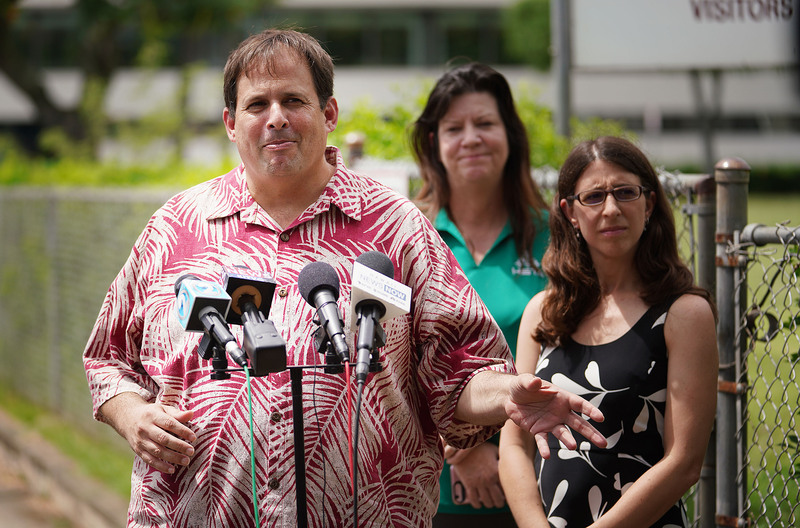 HSTA President Corey Rosenlee, shown here last year with HSTA government relations specialist Mitzie Higa, center, and Deborah Zysman, executive director of Hawaii Children’s Action Network, supports a study of education funding after seeing the constitutional amendment invalidated. 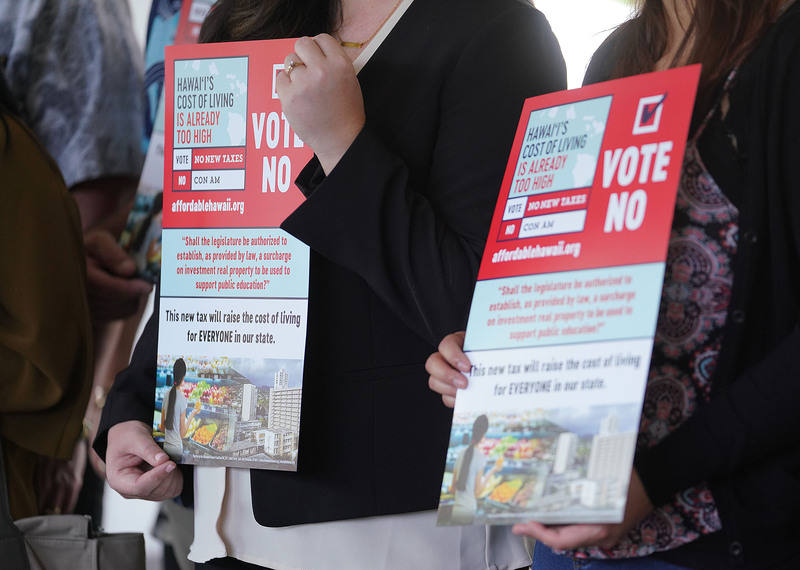 “It was kind of a non-commitment commitment (by legislators) to put that on the ballot,” said Jim Shon, director of the Hawaii Educational Policy Center at UH Manoa. The HSTA argued the DOE, the country’s only statewide school district encompassing 292 schools, 179,000 students and roughly 22,000 administrative employees, is so underfunded that some public school students are deprived of a quality education. The constitutional amendment’s opponents included the county mayors and the real estate and business communities. They said any tax surcharge on investment property would harm the average resident in Hawaii by raising rents across the board in an already unaffordable place. The counties also didn’t want to see the state gain the ability to tax property — something only counties can do now. A recent survey released by the education advocacy nonprofit HawaiiKidsCAN, conducted by Solutions Pacific and Ward Research, indicates that improving public education is a priority for residents — although it’s behind addressing homelessness and even with alleviating traffic congestion. Out of 404 voters randomly polled statewide, 77 percent said they believed public schools should receive more funding, but it’s not clear how their responses would change if that proposed funding was through a new or raised tax. Rosenlee said the biggest ripple effect he’s seen this year from last year’s debate is a shift in legislators’ thinking when it comes to the need for public education funding. He added that it was encouraging to see the GET bill pass out of the Senate, even though it won’t make it through the House. “We are surprised it got so far in the Senate. There was still a desire to fund education and we saw the Senate willing to take up the GET bill,” Rosenlee said. 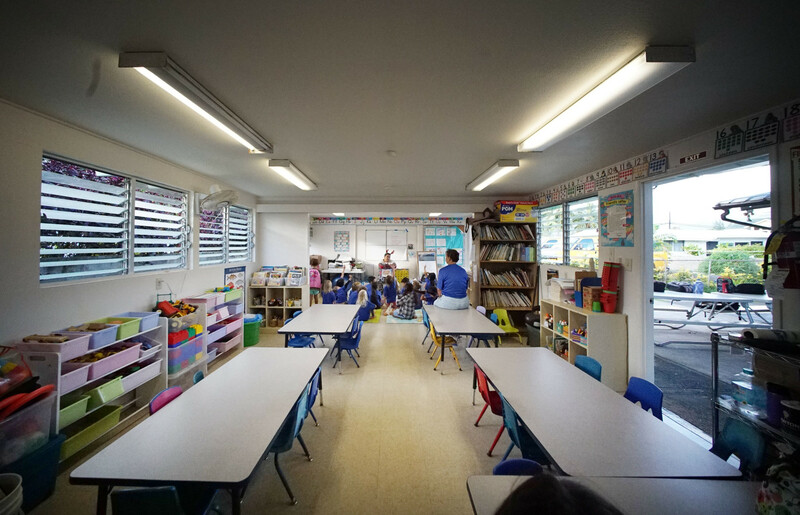 The post The Battle Over Preschool Puts Hawaii Governor On The Hot Seat appeared first on Honolulu Civil Beat. A legislative proposal to clarify which state entity controls the state’s public pre-kindergarten program is moving forward with little agreement on how to handle the issue. The biggest standstill appears to stem from the inability of leaders of both sides — the Hawaii Department of Education and the state Executive Office on Early Learning — to reach some sort of resolution. The person caught in the middle of this? Gov. David Ige. That’s evident through the words of Sen. Michelle Kidani, chair of the Senate Education Committee, who chided the governor’s legislative staff at a hearing on Friday. 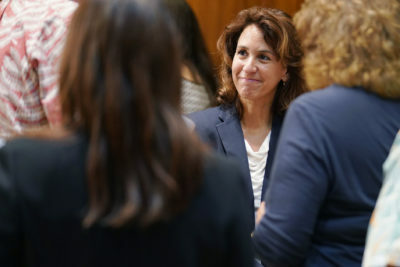 “My recommendation is that the governor sit down with the players because you’re really putting the legislators between adults who should be making decisions for themselves,” she said to Ford Fuchigami, Ige’s administrative director. A bill to clarify that state-funded pre-K is controlled by the Executive Office on Early Learning would keep school principals from opening new pre-K classrooms using DOE weighted student funds. 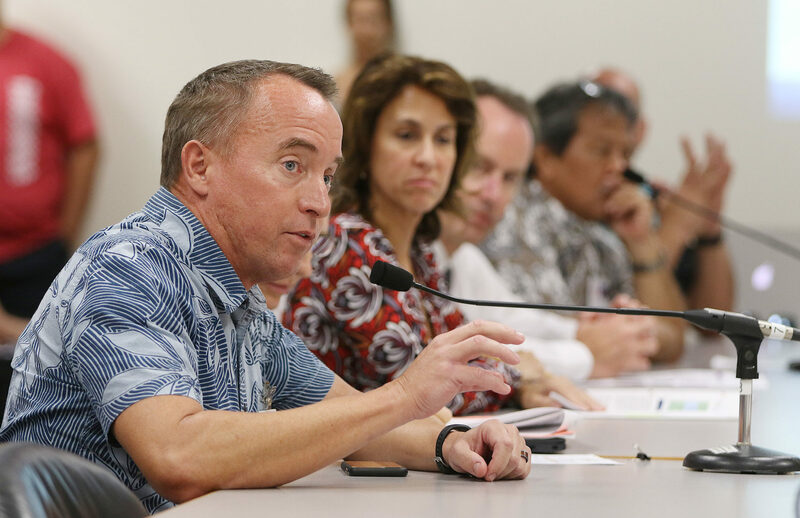 Ige’s position on House Bill 921, which states that the early learning office should have administrative authority over most state-funded pre-kindergarten programs, is that it’s not needed. “When I look at that measure as currently drafted, I really don’t see how it helps us move forward,” he said to Civil Beat after a monthly meeting of the Early Learning Board, the governing entity for the Executive Office on Early Learning. “We have a statewide plan that we’re implementing. It really is about partnership, it’s about each entity taking their responsibility and really allowing us to move forward in early learning,” he added. Ige had just addressed a room of early education advocates and Early Learning Board members at CEED Hawaii on South King Street, mainly to reinforce his optimism for the recently signed Early Childhood State Plan and the need for expanded opportunities for young children. In a brief interview after his remarks, the governor said he could not answer whether he would veto HB 921 if it landed on his desk — saying it depends on what it looks like by that stage. But he made his views on the issue clear. “If we are going to have public pre-K programs, it ought to be integrated into our public schools. And so, any pre-K program on a public school campus ought to be under the jurisdiction of that public school,” he said. HB 921 has been described as clarifying the early learning office’s oversight of state-funded pre-K. The bill is scheduled for decision making in the Senate Education Committee on Wednesday. From there it would go to the Senate Ways and Means Committee. The bill now expressly prohibits the DOE from establishing any “general education prekindergarten classrooms for any purposes except for Title I-funded prekindergarten.” It now also states the DOE cannot use weighted student funds to open up general pre-K classrooms, essentially handing funding authority over to the early learning office. Under the leadership of superintendent Christina Kishimoto, the DOE is staunchly opposed to the proposed legislation, arguing it would strip away principals’ authority from implementing and maintaining pre-K classrooms on their campuses. The DOE asserts that since these classrooms are located on DOE campuses, oversight should ultimately rest with the DOE, essentially making it a preK-12, as opposed to K-12, system. 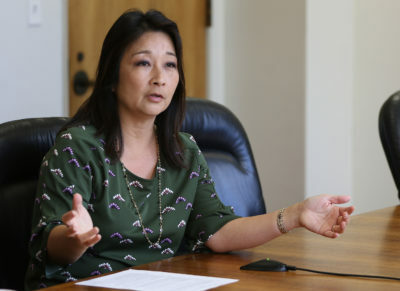 Kishimoto, who’s just shy of reaching the halfway mark in her tenure as superintendent under a four-year contract, has made her position clear. At Thursday’s Early Learning Board meeting, she made a motion for the board to ask the Legislature to “kill the bill” as unnecessary. After a lengthy discussion by Early Learning Board representatives, the motion was narrowly defeated by a 4-3 vote. Robert Peters, chairman of the board, said it was clear “we are struggling through this” given the board’s inability to reach a consensus on the legislation. According to the National Institute for Early Education Research, other states such as Georgia, Massachusetts and Washington state have a separate state entity managing early childhood education, including pre-K programs. Gov. 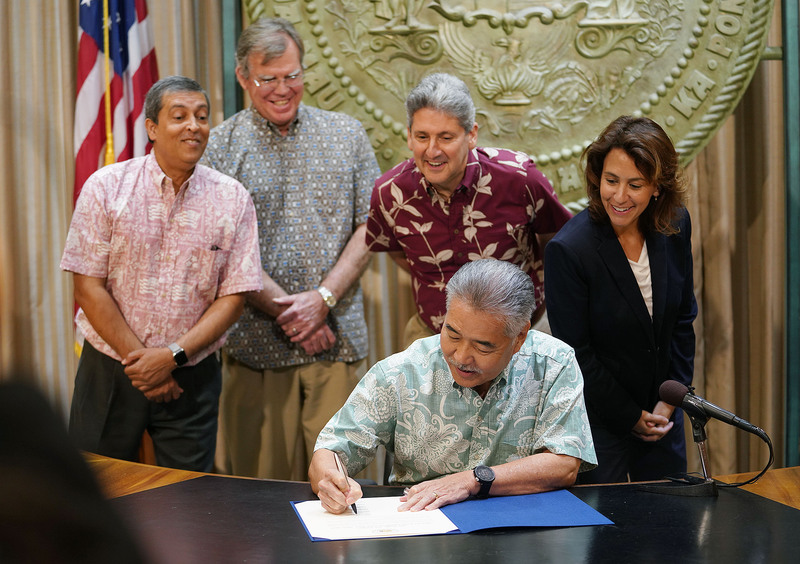 David Ige, seen here signing Hawaii’s Early Childhood State Plan, a broad framework for early learning, is caught in the middle of a brewing debate over who should control state-funded pre-kindergarten. Ige, meanwhile, is in the tough spot of being the bridge between the two entities that are wrestling for the lead on pre-K expansion. The governor appointed Lauren Moriguchi, the current executive director of the early learning office and a former DOE employee, in 2015. And while Kishimoto as superintendent is technically hired and evaluated by the Board of Education, its nine members are appointed by the governor who serve renewable three-year terms. Ige was still a state senator at the time the Executive Office on Early Learning was established in 2012 — it was a touchstone of the administration of his predecessor, Neil Abercrombie, so his investment in the issue doesn’t run as deep. But that hasn’t made his role brokering a compromise between these two parties any less of a challenge. 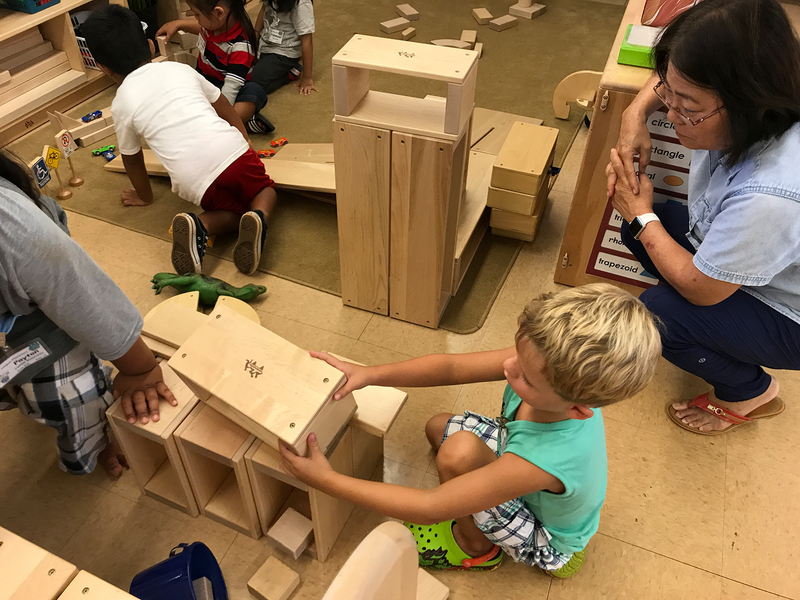 The Executive Office on Early Learning, tasked with building a high-quality early learning system in Hawaii to help its youngest residents attain future success, has so far established 26 pre-K classrooms around the state. The existing classrooms have a potential reach of 520 4-year-olds, but need to be opened at a faster pace, the DOE argues. According to NIEER, Hawaii ranks at the bottom of the country in terms of the proportion of 4-year-olds reached through state-funded pre-K: the program reaches only 2.1 percent of the state’s 4-year-old population, whereas the national average is around 33 percent. The DOE is not opposed to working with the early learning office — which is not part of the DOE, just administratively attached to it — to expanding pre-K. It currently has a memorandum of agreement with the office to clarify certain roles and responsibilities when it comes to data sharing, assessments or professional development. But the legislative attempt to codify in statute the early learning office’s administrative control over public pre-K has set off a massive effort by DOE to defeat the measure. Underscoring these discussions is the belief that the original intent of the early learning office is being turned on its head. “While I have no doubt the Department understands the need and aspects that go into supporting our youngest children and their families as a unit, my concern is that the priorities and concerns of the Department of Education is very different from what we envisioned about the executive office on early learning,” said former state senator Jill Tokuda, who helped lead the efforts to establish the EOEL. “Pigeonholing (this effort) to the department will really cut us off from the need (of) where can we provide the best services all around for our young children,” she said. As HB 921 advances, state leaders have been reminded once again of the need to work something out. The post School Chief Chooses Some Of The People Helping To Evaluate Her appeared first on Honolulu Civil Beat. The post Who Should Run Hawaii’s Pre-K Program? appeared first on Honolulu Civil Beat. 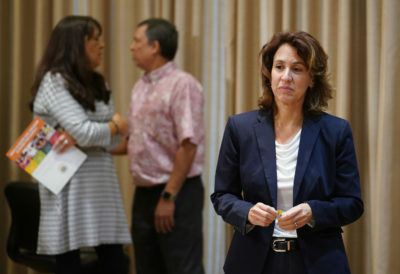 A bill in the Legislature that seeks to clarify the oversight authority of a state office dedicated to early learning in Hawaii has exposed rifts at the core of a supposed working partnership between that agency and the head of the state Department of Education. “All partners at the table are being treated as ‘capable’ leaders when it comes to PreK programming, while HIDOE is being represented as incapable of understanding and managing its own PreK program,” according to Kishimoto’s letter to state Early Learning Board chairman Robert Peters, a copy of which was reviewed by Civil Beat. 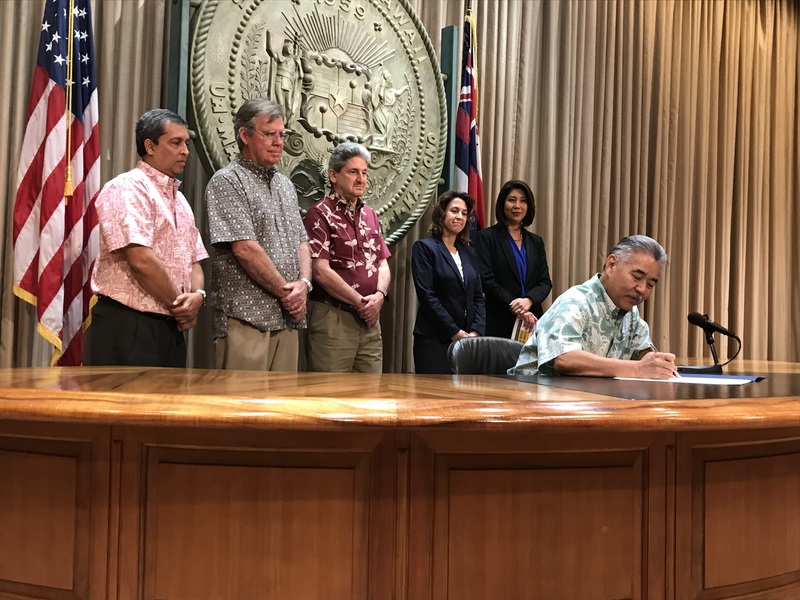 Executive Office of Early Learning Executive Director Lauren Moriguchi, far right, and schools Superintendent Christina Kishimoto, second from right, attend a signing ceremony in January for the state’s Early Childhood State Plan. The underlying tension between DOE and the early learning office, which was established by the Legislature in 2012 to focus on early childhood education from birth to age 5, is playing out as Hawaii embarks on expanding the number of public pre-K classrooms in public schools from its current 26 to more than 300 within 10 years. The split touches on who should be in charge of the pre-K buildout, how much consideration is being given to each other’s expertise and above all, the pace of the rollout of new public pre-K classrooms. HB 921 is one in a series of bills over the last several years that have sought to clarify the early learning office’s role — and it’s not the only one that has been met with DOE resistance. 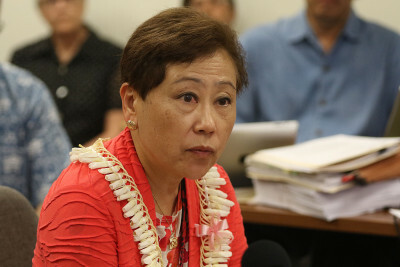 Last year, in what was Kishimoto’s first legislative season since assuming her role in August 2017, she said she objected to a proposal that removed preschool, with limited exceptions, from DOE’s purview. The measure was eventually signed by Gov. David Ige after briefly appearing on his intent to veto list. Established during the Gov. Neil Abercrombie administration, the Executive Office on Early Learning is responsible for establishing a “high-quality” learning framework for pre-K students in Hawaii’s public schools. For the early learning office, that means training pre-K teachers, providing mentoring and professional development and administering and distributing funds to schools that express a desire to adopt a pre-K program. Superintendent Christina Kishimoto wants her agency to have more say in expansion plans for the state’s pre-K program. The existing 26 pre-K classrooms, with a current total capacity of 520 4-year-olds — are known as “EOEL pre-K classrooms.” Those are separate from federally funded Head Start public preschool programs or those exclusively administrated by the DOE for special education or Title I-funded students. 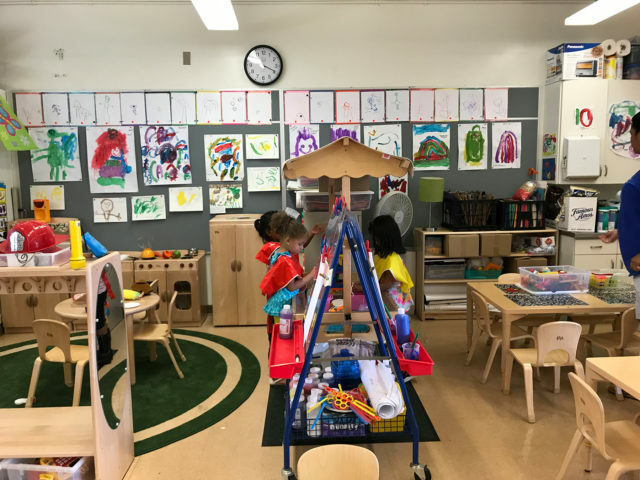 Hawaii has one of the lowest rates of public preschool participation in the country while having some of the most expensive private preschool costs. An estimated 42 percent of the state’s kindergarteners in the 2012-13 school year had not gone through any kind of preschool, known to be a crucial first step in laying the groundwork for academic and social success down the road. The early learning office is seeking $2 million in funding for 22 additional pre-K classrooms on DOE campuses, primarily to fund a teacher and educational assistant in each class. Hawaii’s educational leaders face pressure from community leaders to rapidly increase access to public pre-kindergarten. DOE wants to create the new classrooms at a faster pace than the early learning office. Hawaii currently has one of the lowest rates of children attending public preschool programs. Pictured here are preschoolers playing at Linapuni Elementary in Kalihi. The answer about how fast to expand is not so clear, says EOEL Executive Director Lauren Moriguchi. She has explained in legislative hearings that a high-quality pre-K classroom requires careful training, observation and professional development of teachers given the unique learning needs of kids at that age. HB 921, which passed the House and will now be considered by the Senate, has landed squarely in the midst of these pedagogical concerns, pitting the superintendent and her complex area superintendents against the early learning office and its supporters. Those supporters include early childhood education advocates, parents and some principals. The current bill, according to its sponsor Rep. Justin Woodson, chair of the House Lower and Higher Education Committee, clarifies that the early learning office has administrative authority over all state-funded pre-K programs, except those currently administered by DOE. It does not delineate any new responsibilities to the early learning office or curtail any existing DOE authority over certain public pre-K programs, Woodson said. Rep. Justin Woodson, chair of the House Lower and Higher Eduction Committee, says his bill doesn’t take any current authority away from DOE. But according to Kishimoto, the DOE has been “ignored” in discussions among the EOEL and Early Learning Board. “We have asked specific questions about, how can we be a powerful partner with EOEL to move this agenda?” she said to Civil Beat. “And every step of the way for the last six to eight months I have been deferred multiple times with no response to ideas I’ve put at the table. Multiple principals and complex area superintendents, who oversee large geographic areas comprised of neighboring high schools and their feeder elementary and middle schools, made a rare appearance at a Feb. 21 House Finance hearing to oppose the bill. “I’ve never seen a hearing where six (complex area superintendents) show up,” said Rep. Roy Takumi, the former longtime House education committee chair. Takumi said public pre-K programming was an area the two previous superintendents — Pat Hamamoto and Kathryn Matayoshi — were happy to leave in the early learning office’s hands, given the gargantuan task of managing the K-12 system.